An eco-friendly residential building is beneficial for lowering negative impacts on the environment as well as positively impacting health and wellbeing of the occupants living within. Eco-friendliness of a building does not only depend on its low energy usage during occupancy but also on how it was constructed, what materials and systems were used in its construction and how much total energy, materials and water resources will be used during its different life cycle stages. Life cycle assessment (LCA) is the most universally accepted method for analyzing the environmental impacts of a building. LCA for a residential building estimates the potential emissions from a house during its life cycle stages, and allows decision makers to make strategic plans for improving environmental performance. Global warming potential, eutrophication potential, acidification, fossil fuel consumption, human health particulate emissions etc. are the most commonly assessed environmental impacts measured through LCA. Athena Impact Estimator software was used to assess environmental impacts of H2M and H2D. LCA results for global warming potential, eutrophication*, human health impact and fossil fuel depletion were determined. Scores of different impacts were combined into a single overall LCA score using BEES weightsa which ranks global warming most important among different impacts. LCA results show that all the impacts in the pre-occupancy stage of H2M are slightly higher than H2D. These higher results are due to more resources used during manufacturing stages of different H2M components as compared to H2D. An example of higher resource consumption is a triple glazed window that needs more materials than double glazed for H2D. During use stage all evaluated impacts for H2D are higher than H2M. Increase in energy efficiency by use of LED lighting, more efficient HVAC system, reduction in energy losses due to better building envelope (Ex: ICF walls, triple-pane windows etc.) and utilization of low-emission energy sources such as geo-thermal and solar PV are key causes for this. 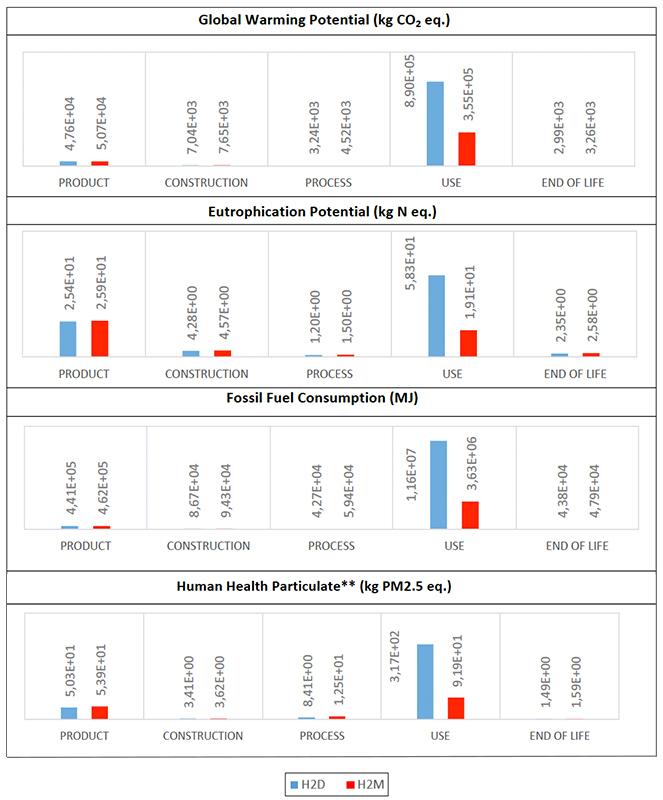 The comparison of the post-occupancy stage shows high emissions for H2M compared to H2D. However, the LCA impacts of post-occupancy stage are negligible compared to pre-occupancy and occupancy stages. Overall environmental impact score shows that environmental impacts for all life cycle stages of H2M are significantly lower than H2D. Based on this analysis 55% of the total life cycle impacts can be reduced if we switch towards home features similar to H2M. a Gloria, Thomas P., Barbara C. Lippiatt, and Jennifer Cooper. 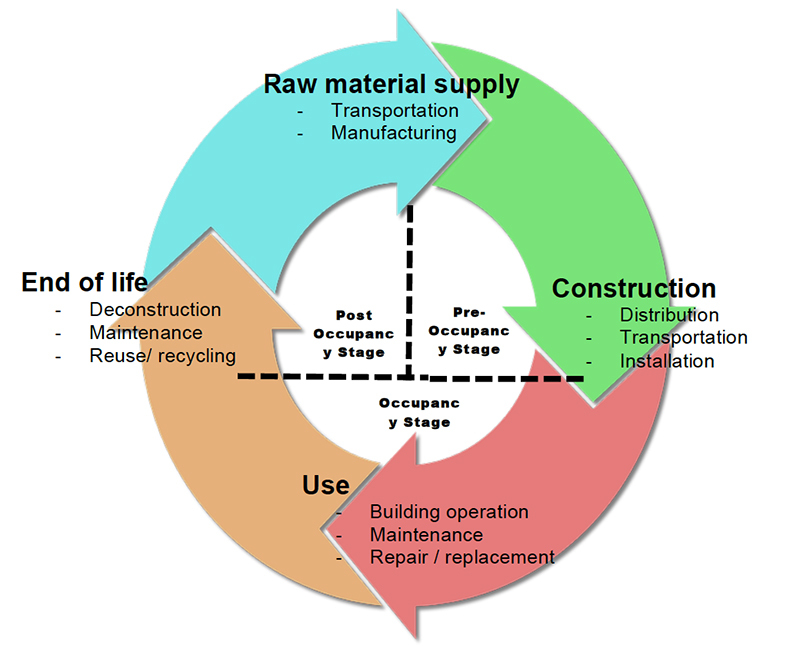 “Life cycle impact assessment weights to support environmentally preferable purchasing in the United States.” Environmental Science & Technology 41, no. 21 (2007): 7551-7557.